Typhoid fever is an infection caused by the Salmonella typhi or Salmonella paratyphi bacteria. Being a bacterial infection, typhoid fever treatment mainly involves the use of antibiotics to kill the typhoid bacteria. Doctors usually recommend antibiotics for typhoid fever treatment. Antibiotics are used to resist the progress of typhoid and the growth of the typhoid bacteria in the body. They reduce the duration of the typhoid fever symptoms (from 14-25 days to 3-5 days) if the treatment is started at the earliest. Antibiotics kill the infectious agent, preventing the progress of the infection. With the use of appropriate antibiotics, the mortality rate in cases of typhoid has been reduced from 15% in the past to less than 1%. Previously, antibiotics like Chloramphenicol, Ampicillin, and Trimethoprim-sulphamethoxazole were used to treat typhoid, but due to various undesirable effects and reasons, they have become obsolete. Modern day antibiotics include Ceftriaxone, Cefixime, Cefotaxime, Ciprofloxacin, and Azithromycin. These drugs are more effective than the older ones and also have fewer side effects. Drug selection is based upon the sensitivity of the typhoid bacteria to the drug in question. The response of the bacteria has to be tested with culture and sensitivity studies in the laboratory. Other factors for selecting the appropriate drug include the patient’s tolerance toward the drug, the presence of any kidney or liver disease, and the data generated from the studies conducted in that particular geographical region. Over a period of time, the typhoid bacteria become resistant to the effects of some drugs, despite having been sensitive to them earlier. This phenomenon is called bacterial resistance. The frequency and duration of drug administration varies with the severity of the disease, the drug chosen, and the standard dosage schedules advocated for these drugs. The drug may be administered either orally or through injections directly into the veins. The dosage schedules must be followed strictly as per the doctor’s advice. Reducing fever- As patients may have high grade fever as a typhoid symptom, antipyretics (drugs that control fever) like Paracetamol can be used to normalize the body temperature. Fighting body aches and headaches – Headaches, muscle pains, and generalized body pain can be treated with analgesics (drugs that alleviate pain) like Paracetamol, Ibuprofen, and Diclofenac. Surgery may be required only in patients with complications of typhoid, such as intestinal perforation and peritonitis (spread of the infection to the peritoneum in abdomen). In the case of people who are long-term carriers of the Salmonella bacteria, if antibiotics fail to destroy the bacteria, the gall bladder may be removed to eliminate the site of the Salmonella typhi colonization. If you have a typhoid infection, rigidly follow the drug schedules prescribed by your doctor. This helps reduce the chances of complications, hastens the recovery process, and decreases the duration of the illness. Maintain high levels of sanitation. Ensure that you wash your hands properly after using the toilet and before eating food. Drink safe water and reduce the risk of water contamination by adopting measures like boiling and chlorination of water. Complete the prescribed course of medication to avoid becoming a long term carrier of typhoid even after the symptoms have disappeared. Keep an eye out for the occurrence of similar symptoms again in future, as this could indicate a relapse. Typhoid treatment measures include increased levels of hygiene. Typhoid fever treatment is mainly dependent on the use of antibiotics to kill the typhoid bacteria. Early diagnosis through the Typhoid test and subsequent treatment of the infection can help avoid complications like intestinal perforation. If you have been infected with typhoid, ensure that you strictly follow your doctor’s advice to recover quickly and avoid becoming a long-term carrier of the typhoid bacteria. Typhoid fever is an infection caused by the Salmonella typhi or Salmonella paratyphi bacteria. Observing the typical pattern of typhoid fever symptoms helps doctors diagnose and treat typhoid better. High grade fever is the most common of typhoid fever symptoms. Typhoid symptoms vary widely and are very much similar to the symptoms of other microbial infections. Here are some of the common typhoid fever symptoms. It may take anywhere between 3 and 21 days for typhoid symptoms to appear after the entry of the Salmonella bacteria into a person’s body. This duration is called the incubation period. In patients who are not undergoing any form of typhoid fever treatment, there is a specific pattern of symptoms, which can be classified into 4 phases. Each phase lasts for about a week. Here are the four phases mentioned above. It is important to note that symptoms refer to the effects experienced by the patient, while signs refer to the doctor’s findings noted after his clinical observation of the patient. During the first phase, a blood sample taken from the subject is put over a culture medium that favors the growth of bacteria. This sample is then subjected to microscopic examination to detect and confirm the presence of the Salmonella typhi bacteria. Rose spots are common symptoms of typhoid fever. This phase occurs during the fourth or fifth week of the infection. During this phase, the fever may subside. If it still continues in the form of high spikes, dehydration may occur. If typhoid fever symptoms are observed early, the diagnosis and treatment of the infection can be done in a timely manner, with the right antibiotics. A simple typhoid test can help in identifying the disease. If left untreated, the infection can cause various complications, some of which may even require surgical intervention. So, the next best thing to preventing typhoid is to seek immediate clinical treatment for the infection. One of the main causes of typhoid fever is the feco-oral transmission of typhoid bacteria. Unsafe sanitary practices lead to the contamination of water and food by the typhoid bacteria, in turn encouraging the spread of the disease. Insects like the housefly are indirect causes of typhoid as they help in transmitting the disease through food and water. The bacteria Salmonella typhi and Salmonella paratyphi are the main causes of typhoid fever. They are know to infect only humans. The typhoid infection usually spreads through food and water that has been contaminated with the salmonella bacteria. This bacteria is transmitted to insects (e.g. 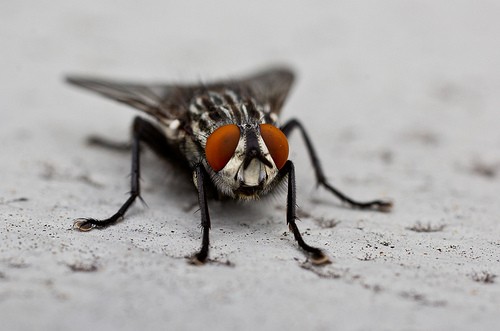 the house fly) that feed on stools. When a person consumes water or food that has been contaminated by these insects, the Salmonella typhi bacteria enter the person’s body, causing the typhoid infection. The infectious dose is a term that refers to the number of bacteria that need to enter the body to cause the infection and the characteristic typhoid fever symptoms. This number can vary from 1 thousand to 1 million bacteria. The possible reason for such a large variation in number could be that the Salmonella bacteria have varying abilities to resist the highly acidic environment of the stomach. The body has a protective mechanism in the form of a highly acidic environment in the stomach to counter various bacteria. As a result, the ability of bacteria to escape unaffected from this environment decides their fate in the body. Once the Salmonella typhi escapes from the strong acid barrier in the stomach, it travels to the small intestine, where it has to fight against other defense mechanisms of the body, such as Lysozymes (chemicals that destroy infective organisms) and small intestinal secretions that contain some cationic antimicrobial substances. After passing through all the hurdles the body presents, the bacteria invade the intestinal membranes and stay inside Payer’s patches. Payer’s patches are collections of lymphoid cells (that protect against infections) in the intestinal walls. After crossing the intestinal membranes, the bacteria enter the circulatory system and spread to various parts of the body like the liver, bone marrow, and the lymph nodes. The bacteria then start forming colonies at these sites. During this phase, the patient may remain asymptomatic. 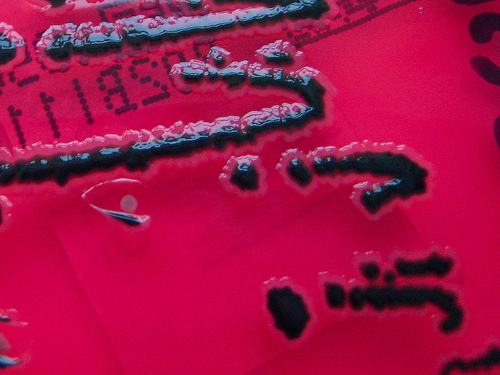 The symptoms begin to manifest when an adequate number of bacteria have been produced after replication. Repeated Use Of Antacids: Drugs that decrease acidity, when consumed frequently, create an environment suitable for the typhoid bacteria. Diseases of the stomach associated with reduced acid production also weaken the acidic barrier of the stomach. Surgery: A history of surgery on the stomach or the intestines is also an important factor. 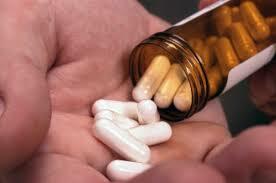 Excessive use of antibiotics: Antibiotics are used to cure various infections. But when used inappropriately, they may damage some helpful bacteria that live in the intestines and prevent the growth harmful organisms. Are You A Carrier Of The Typhoid Bacteria? Though typhoid symptoms completely disappear after the treatment of the infection, there is a chance that the patient will keep shedding the bacteria through his stools or urine for more than a year. This bacteria often gets transmitted to food and water, contaminating both in the process. Who Is At Risk Of Being A Carrier? People with previous episodes of typhoid are also prone to be carriers. The following measures can go a long way in countering the spread of typhoid. As the main causes of typhoid are usually unsanitary conditions and the consumption of contaminated food and water, it is best to take immediate precautions to counter these factors. The infection can be easily diagnosed by taking a typhoid test during the initial stages of the disease, when the symptoms start showing. Typhoid fever, a bacterial infection caused by Salmonella typhi and paratyphi, may prove dangerous if not diagnosed and treated on time. Untreated typhoid may result in serious complications like intestinal perforation, peritoneal infection, and intestinal bleeding or ulcers. These harmful possibilities make the early diagnosis and typhoid fever treatment very important. A laboratory typhoid test can confirm the diagnosis of typhoid fever. A typhoid test can help detect the presence of Salmonella and confirm a typhoid infection. Here are some of the common typhoid tests conducted as part of typhoid diagnosis. The Widal test detects the presence of the antibodies that act against the antigens of typhoid bacteria. The substance that triggers the formation of an antibody is called an antigen and a particle produced by the body on exposure to an antigen is called an antibody. During typhoid infections, two types of antigens namely ‘H’ and ‘O’ are present in the blood of the patient. The antigen ‘H’ is derived from the flagella (a tail-like structure) of bacteria, while the antigen ‘O’ comes from the body of these organisms. When a person acquires a typhoid infection, these antigens are sensed as foreign particles by the body and in response to them, the body produces antibodies. These antibodies can be detected with the Widal test. How Is The Widal Test Done? In a test tube (or over a glass slide) the blood sample taken from the patient is allowed to react with a solution that contains antigens (H and O) of typhoid bacteria. Now, if the blood contains antibodies against these antigens, clumping appears in the mixture. This clumping can be seen with naked eyes. 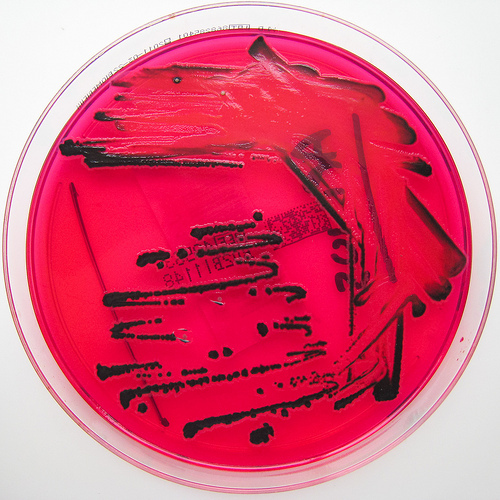 Serial dilutions of Salmonella antigens are done in different test tubes (or on slides) and the patient’s blood, taken as a sample, is mixed with them. The level of specific titre (concentration) is noted and the result is interpreted accordingly. A titre that exceeds 200 for antigen H and a titre above 100 for antigen O antigen are considered as significant. The Widal test is not very accurate. Also, the results of multiple tests are more reliable as a single test might not prove conclusive. Though it is easier, faster, and cheaper to perform than other tests, the Widal test has a few limitations. It cannot distinguish between the antibodies present due to the current infection and the ones left over from previous infections. There is a chance that other infections may yield a positive result on this test. Patients who have been vaccinated against typhoid may also show positive results on the test. The Widal test may be negative in the first week and the titres begin to rise at the end of the first week or at the beginning of second week. Between the second and fourth week, the titres rise gradually and then decline slowly. Patients treated with antibiotics may not show any rise in titres. Culture is probably the only specific method to diagnose typhoid. It is considered as the ‘Gold standard’ method for diagnosing typhoid fever. Cultures can be generated using samples like blood, urine, stool, bone marrow, and intestinal secretions. One of these samples is spread over specific culture media that is designed to favor the growth of Salmonella. The culture shows typical characteristics that help identify these bacteria. Stool culture may remain negative during the first week. It becomes positive by the third week of typhoid, if it has not been treated until then. Stool culture is a good way of detecting a long-term carrier state, as the carrier person can shed Salmonella for more than a year. Results of a blood culture may vary as per the duration of the illness. High yield may be observed during the first week of infection and this decreases gradually by the third week. The yield of the culture is determined by the number of Salmonella bacteria present. There are chances that with antibiotic therapy, the yield will decrease. It is a more sensitive method than blood culture to detect the presence of the Salmonella bacteria. Culture generated from intestinal secretions may show a positive result even when the bone marrow culture gives a negative result. This helps eliminate any false negatives. Typhidot-M, a new typhoid test, detects IgM and IgG (Immunoglobulins M and G) type of antibodies in the blood of the patient. Typhidot is capable of detecting typhoid within 2-3 days of infection and its results can be generated within few hours. IgM antibodies are indicative of recent infection while IgG antibodies indicate past infection. As Typhidot can distinguish between IgM and IgG, it becomes easier to diagnose recent infections. The Widal test, though not very specific for the diagnosis of typhoid, is usually the typhoid test of choice due to its simpler, faster, and cost-effective method. Typhoid can turn fatal if it is not diagnosed and treated in a timely manner. If you suspect a typhoid infection or see any typhoid fever symptoms, consult a doctor immediately. Typhoid fever is a bacterial infection that occurs in human beings, affecting people of almost all age groups. It is called so because its neurological and behavioral symptoms resemble the symptoms of the typhus infection (caused by a different microbe). It is also known by other names like pythogenic fever and nervous fever. A strain of the Salmonella bacteria causes typhoid fever. The Salmonella Typhi bacteria is the primary cause of typhoid fever. A variant of typhoid fever is called paratyphoid fever. This infection is caused by the bacteria Salmonella Paratyphi. Typhoid fever and paratyphoid fever are collectively called enteric fever. Are You A Carrier Of Typhoid Fever? A carrier of typhoid fever is a person who does not show any symptoms of typhoid, but harbors the Salmonella Typhi bacteria inside his body. A patient may turn into a carrier of typhoid bacteria even after his symptoms have disappeared. A carrier may keep shedding the Salmonella Typhi bacteria through his stools or urine for about more than a year, and acts as potential source for the contamination of food/water and the spread of the disease. How Does Typhoid Fever Spread? The stool or urine passed by a typhoid patient may spread the disease as they contain such bacteria. When these infectious microbes mix with a source of water, they cause its contamination. People such as hotel cooks, hospital workers, and hospital staff carry a high risk of being carriers and contribute to the spread of typhoid fever. People who use antacids frequently are at risk of spreading the infection, as antacids reduce acid production in the stomach and create a favorable environment for the bacteria to thrive. Patients with intestinal diseases, biliary diseases, or diseases of the stomach are also capable of spreading typhoid fever. Children who are less than 1 year of age and people who inadvertently use antibiotic medicines also carry the risk of transmitting this infection. Fever: The body temperature of the affected individual may rise up to around 1030 or 1050 Fahrenheit. About 75% of typhoid patients experience fever as the main symptom of the infection. The fever may fluctuate and may be associated with chills as well. Aches: The patient is likely to experience muscle pain, generalized body ache, and headaches. Fatigue and weakness are also common symptoms. Abdominal Pain: This can be observed in around 20 to 40% of typhoid patients. Low Appetite: This is also one of the most common typhoid symptoms. Constipation/Diarrhea: Some patients report constipation, while some complain of diarrhea. The frequency of stools may increase up to 6 to 8 times a day. The stool also carries a characteristic smell. Neurological Symptoms: The patient’s behavior is altered, and he often wears a confused look. 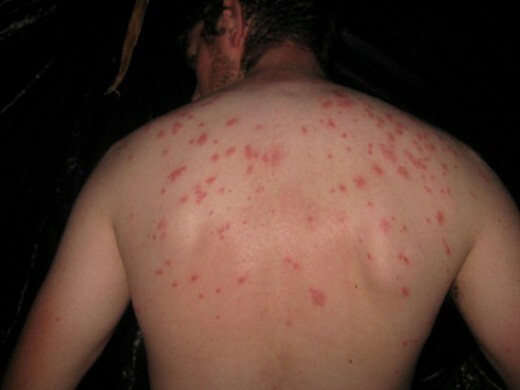 Rashes: Rose spots may appear over the skin of the patient’s chest and in his abdominal region. Besides these general symptoms, the typical pattern of fever experienced by patients helps distinguish typhoid from other diseases. After acquiring a typhoid infection (i.e. after the entry of the Salmonella bacteria into the body), the incubation period can vary from 3 to 21 days. Once it is over, the symptoms start appearing. The pattern of symptoms and signs varies as per the duration of typhoid and the course of treatment adopted. The symptoms vary during the first through the fourth/fifth week. Why Is Typhoid Fever A Serious Condition? Though the symptoms of typhoid fever appear like those of very commonly occurring illnesses, typhoid may prove dangerous if not diagnosed early through a typhoid test or paid adequate attention. In untreated cases, typhoid fever may complicate things with intestinal perforation, spread of the infection to the peritoneum (sac around the intestines, in the abdomen), intestinal bleeding, or other serious complications. This fact makes it very important to diagnose and treat typhoid fever at the earliest. Previously it was a fatal disease, but with the use of antibiotics, death rate due to the disease and its complications has reduced to a great extent nowadays. Though the typhoid fever treatment measures are many, the disease is mainly countered in three ways. Destroying Salmonella Typhi present in the patient’s body is the aim of such therapy. Various antibiotics are used to kill these bacteria, and examples of these include Ciprofloxacin, Ceftriaxone, and Cefotaxime. The choice of drug, its dosage, and the duration of the therapy depend on factors such as the severity of the illness, the age of the person, and the sensitivity of drugs. For fever, antipyretics (fever-reducing drugs) like paracetamol are used. For headaches, body aches, and muscle pains, analgesics (painkillers) like ibuprofen and diclofenac are used. Complications of typhoid such as intestinal perforation and peritonitis have to be treated with surgical intervention. The treatment depends upon the type and severity of the complication. Take adequate hygienic and sanitary measures. Insist on important practices like washing hands properly, eating uncontaminated food, and drinking uncontaminated water. Boil water or simply chlorinate it before drinking. Typhoid fever can turn out to be fatal if it‘s not diagnosed and treated at the right time, and the best way to beat it is by preventing it in the first place.